Crossovers happen in comics all the time, but very rarely do they happen across publishers. BOOM! Box and DC Comics are dipping their toes in the publisher crossover universe with Lumberjanes Gotham Academy #1. The issue is written by Chynna Clugston Flores, penciled by Rosemary Valero-O'Connell, inked by Maddi Gonzalez, colored by Whitney Cogar and lettered by Warren Montgomery. The Lumberjanes and Gotham Academy have always prided themselves on their investigative natures and Flores doesn't disappoint in that regard. Flores deftly juggles the two different groups well, starting the book off with a Lumberjanes flair before working in the denizens of Gotham Academy. Both groups are investigating various scenarios and Flores dovetails the two in a way that gives the book plenty of coherency and sense. The issue is paced in a way that doesn't feel rushed, with Flores moving through the two groups pretty leisurely before they join up. And Flores' dialogue is very snappy, giving all the characters plenty of room to be individuals while also allowing the two groups to blend together. The pencils for Valero-O'Connell are very sharp and concise. Each of the characters from both the Lumberjanes and Gotham Academy universes are easily recognizable and Valero-O'Connell's style lends well to the characters from both series. Backgrounds are populated in a way that gives life both to the Academy itself as well as the forest. The panels are laid out to give the reader a good look at all the action as Valero-O'Connell and there even some more whimsical panels (such as binocular lens shaped ones) that keep the look feeling fresh. The inks and colors by Gonzalez and Cogar also provide an eerie atmosphere for the students to investigate the mysteries. 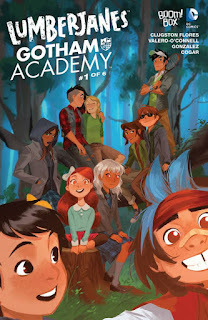 The premise behind Gotham Academy certainly wasn't new when it debuted in 2014, yet joining it with the team of Lumberjanes makes a lot of sense and works very well. The investigation the two groups are pursuing has something of a seemingly supernatural component to it which will definitely up the interest factor quite a bit. Flores' script flows really well and is delivered smoothly. Valero-O'Connell's illustrations are clean and breezy, presenting a somewhat cheerful take on an otherwise dour setting. Lumberjanes Gotham Academy #1 is a lot of fun and brings together two worlds that are effectively mirrors of one another--save for the setting. Lumberjanes Gotham Academy #1 is in stores now.